Feel free to skip to the section below that is most relevant to you. Then save the file through File > Save As and save it with the filename helloworld.py. The .py at the end is very important, as it makes it clear that it is a python script file. If so, then congratulations! It worked! Save the file as helloworld.py. Then open up your terminal (mac/linux) or command prompt (windows). Navigate to your the folder that contains your helloworld.py file. The commands to do this will vary depending on operating system. If you do, congratulations! It worked! Save your file as helloworld.py. 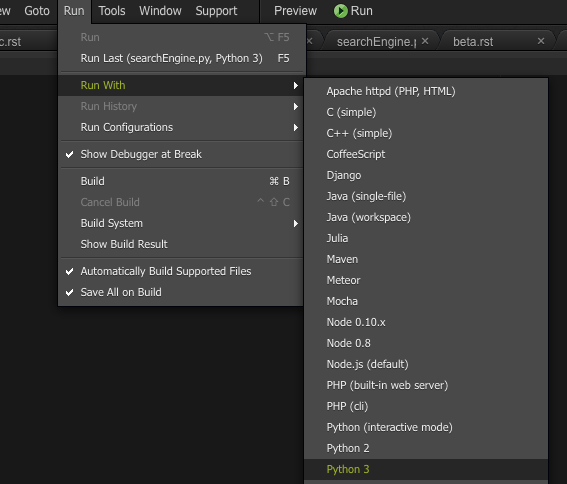 To run the file, click on Run > Run With > Python 3. If you just hit > Run at the top, it will default to python2. You want python3. If that is what you see, then congrats! It worked!